Having a two year old is hard, but having a three year old is even harder! It is almost like Aidan turned three and a switch went off. Now I fully understand that saying about a boy being “a noise with dirt on it.” He doesn’t stop running, talking, screeching or laughing for hours straight. Being pregnant poses a huge challenge for me! Somehow, I still find the energy to keep up with him. More importantly, I find the time to make sure he’s eating properly. 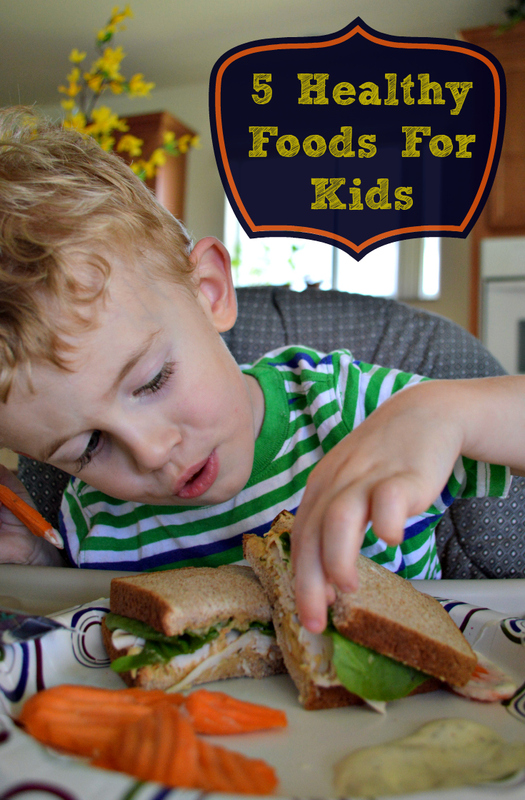 Since toddlers are constantly on the go, their diet is an important element to keep up with. Especially since Aidan was a preemie, I always make sure he is getting enough fruits and veggies, as well as all of the extra calories, that he needs. Blueberries: These berries are filled with tons of great antioxidants. They are considered a super food, and are great at protecting against diseases such as heart disease and diabetes. Carrots: They have the sweet taste that kids crave, yet pack tons of vitamins like the vision enhancing vitamin A. Carrots are also packed with folate, and dietary fiber. Turkey: Roll up some turkey and cheese or throw it on a sandwich. Turkey is one of the healthiest forms of poultry that you can serve your little one. It is packed with protein yet low in fat and calories. Whole Grains: Serving your children whole grains, such as whole grain bread, is a great way to pack extra vitamins and fiber into their diet. It also aids with digestion, weight management and reduces the risk of many diseases. Greek Yogurt: It contains tons of healthy bacteria known to aid digestion and boost immunity. Greek yogurt also contains less sugar than regular yogurt and will help to prevent a blood sugar crash after breakfast. A healthy homemade lunch can help you keep your kids happy and energized all day long. Since many schools have banned using traditional peanut butter on sandwiches, you can use substitutes to create delicious sandwiches your kids will still love. 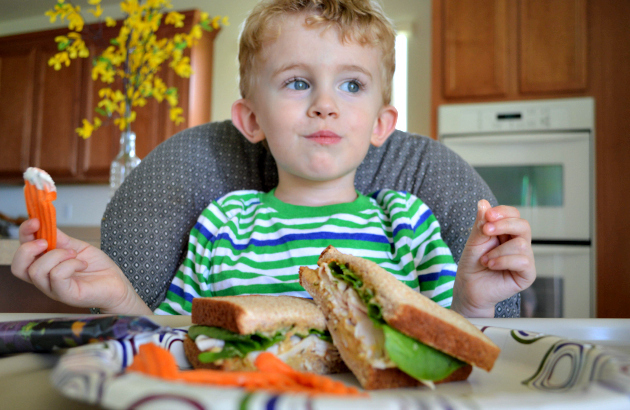 My simple turkey and Sabra Hummus sandwich was a real hit with Aidan! I even threw on some baby spinach to add in some extra iron and vitamins! Carrot sticks with a dollop of ranch dressing as a side is always a hit. Remember, kids eat with their eyes! Some of the healthiest foods are also the most colorful. Be sure to incorporate lots of these fun and colorful foods in your child’s next meal. Shopping for healthy foods for your kids doesn’t have to be a chore. In fact, you can find everything your child loves at your local BJ’s Wholesale Club! BJs isn’t just a wholesale store for bulk paper products and housewares. They have fresh fruits and veggies, whole grain bread and lots of healthy snacks for you to incorporate into your child’s lunchbox! What is your child’s favorite healthy snack?